To make your HTML, PDF, and PostScript reports more powerful, you can insert visual representations of selected data directly into the report output. These visual representations are in the form of vertical or horizontal bar graphs that make relationships and trends among data more obvious. Vertical or horizontal bar graphs highlight relationships and trends among data. Vertical Bar Graph. You can apply a vertical bar graph to report columns associated with an ACROSS sort field. The report output displays a vertical bar graph in a new row above the associated data values, as shown in the following image. Bar graphs that project above the zero line represent positive values, while bar graphs that project below the zero line represent negative values. Horizontal Bar Graph. You can apply a horizontal bar graph to report columns. The report output displays a horizontal bar graph in a new column to the right of the associated data values, as shown in the following image. Bar graphs that project to the right of the zero line represent positive values, while bar graphs that project to the left of the zero line represent negative values. The length of each vertical or horizontal bar graph is proportional to the magnitude of its associated data value. The shortest bar graph appears for the value with the minimum magnitude, the longest bar graph for the value with the maximum magnitude, and bar graphs of varying length appear for each value within the minimum-maximum magnitude range. Notice in the figure that a value of 147,490.00 produces a longer horizontal bar graph than a value of 50,153.00. Therefore, a complete row of vertical bar graphs or a complete column of horizontal bar graphs forms a bar chart. 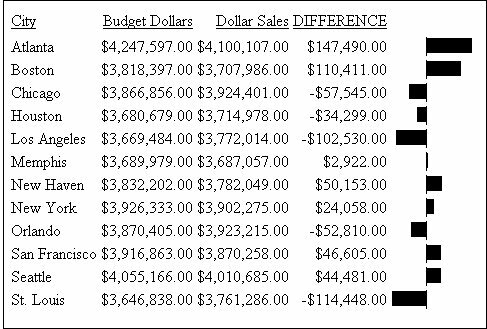 You can only apply data visualization bar graphs to numeric report columns (integer, decimal, floating point single-precision, floating point double-precision, and packed). Bar graphs applied to alphanumeric, date, or text field formats are ignored. OLAP-enabled HTML reports, where bar graphs are applied to measures. For more information on OLAP, see the Online Analytical Processing (OLAP) manual. Other HTML, PDF, or PostScript reports, where bar graphs are applied to columns. See Associating Bar Graphs With Columns in the Creating Reports With Report Painter manual. You can also apply data visualization bar graphs to columns by adding a StyleSheet declaration to a procedure that includes the GRAPHTYPE attribute. For details, see the Creating Reports With WebFOCUS Language manual.